This quietly elegant box was made to grace a console table in an entrance hallway. It was custom designed to accommodate watches, garage door remotes, and miscellaneous small articles that otherwise cluttered the console table. Nogal wood was chosen because of its darkness and uniformity. The top design was inspired by one of Kathy's serving trays. The centre panel on the top was made flush with the sides, with a slight v-groove around the edge. Top was made of 1/8" (3 mm) Nogal, with four bands of Curly Maple which are delineated with Padauk veneer, and laminated to both sides of 1/4" (6 mm) plywood. This construction not only makes the interior of the top as attractive as the exterior, but also prevents warping of the top. Tray and dividers are solid Nogal. Interior is lined with a luxurious black faux-suede. The tray was divided into four equal compartments for small jewelry and articles. 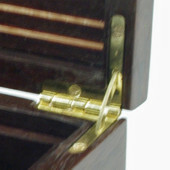 Below the tray were two compartments for watches and one for remotes.